Zip Lines are relatively safe. 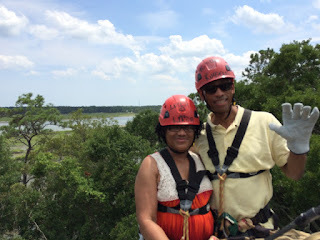 At least, that's what I was told at the top of a 350 foot platform in Hilton Head Island, South Carolina. The fact that the tree we were standing in was swaying to and fro was considered a good sign that the tree would not fall. Bea, our guide said she should we catch us but if not, the line would hold until we could be pulled back up. We would not dangle for too long. Why did I keep swinging from tree to tree following a woman I did not know, wearing gear I had never seen before swinging from cables connected to one hundred year old trees? What's worse, no one mentioned a safety certificate or current inspection sticker. It's amazing, how we nonchalantly put our trust in man. The fall is long and hard when trust is misplaced.